Today, the 8th September 2014, people are celebrating International Literacy Day all around the world. Launched by UNESCO, it aims to promote the importance of literacy to individuals, communities and societies around the world. The theme of International Literacy Day in 2014 is “Literacy and Sustainable Development”. Literacy is one of the key elements in promoting sustainable development. It empowers people to make the right decisions around economic development, social development and environmental protection and forms the basis of lifelong learning. It is apt then, that on this day, in the highlands of Santa Cruz Island in Galapagos, in a village called El Cascajo, the Galapagos Conservation Trust team and our partners at The Book Bus are launching our joint outreach and educational project. Discovering Galapagos is our new curriculum-linked educational resource which focuses on the unique Galapagos Islands as a lesson for the world. It has been developed for a UK and Ecuadorian audience with two separate websites, one in English and one in Spanish, which are connected by a bilingual blog. Although it is reported that there is near 100% literacy in the children in Galapagos, being able to read and remember words is only one piece of the puzzle. With this project, we are aiming to encourage independent learning and comprehension among students focusing on themes around conservation. We hope to inspire and engage students in the sustainable development of the Galapagos Islands and the wider world. Children of today are tomorrow’s conservation ambassadors. With The Book Bus volunteers, resources from Discovering Galapagos will be used with teachers on the Galapagos Islands to raise awareness of conservation as well as improve literacy levels. On Santa Cruz today, the team are running the first three Discovering Galapagos sessions for children aged 5 to 11 using material from the Galapagos Tortoise Movement Ecology Programme. This project will continue to grow and we hope to eventually reach every school on the Islands. Remember to follow the Galapagos Conservation Trust on Twitter and like us on Facebook and to check out the good work our partners are doing over at The Book Bus. 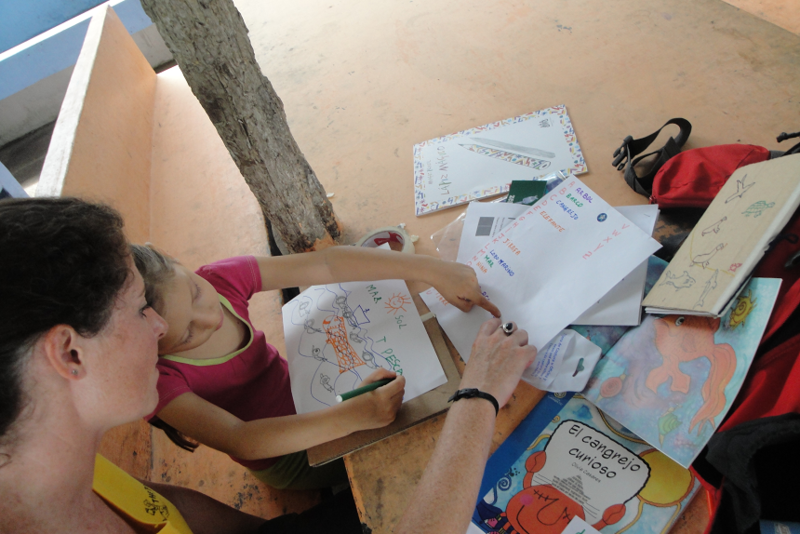 Categories: Projects | Tags: Discovering Galapagos, International Literacy Day, projects, Santa Cruz, The Book Bus.